Have you ever seen King of Curry? No? Now you have the chance! 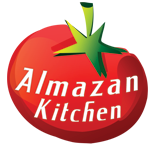 AlmazanKitchen invites you to the audience with Its Majesty! Integral rice, chicken legs, awesome fresh veggies, special spices, greens and coconut milk – magically mixed by Boki in the forest near running water into mind-blowing, mouthwatering and very healthy dish. Alex’s masterful close shots will reveal you all cooking secrets, while food sizzling and knife tapping sounds will relax and gently transcend you into our mystical forest. Just let flow catch you and enjoy! Slice 1 big onion, 1 sweet potato (unpeel it) and 1 big carrot. Quarter chicken legs by cutting through joints. Preheat the pan, grease it with oil. Toss in meat and 2-3 garlic cloves. Cook for 1 min stirring. Add 1 tbsp. of Almazan curry mix, and 1 tbsp. of chili flakes, onions, carrot, sweet potato and handful of young peas. Stir well. Add some water. Chop young purple onion and green chili, toss it into the pan. Add 1 cup of coconut milk. Cook and stir for 5-10 min. (302 F°/150 C°). Serve curry together with rise, finish off with chopped parsley and lemon juice. What is the Almazan Curry Seasoning have in it? Can I buy it or make it? Our special spice mixes will soon be available for purchase. Hi, How do I make the Almazan Curry mix used in The King of Curry recipe? I have looked everywhere and cannot find the info.